Perfect on tables, shelves, counter tops, and more, this nut cracker measures 4.25" x 4.25" x 14". Features a moving nutcracker mouth with a lever behind the nutcracker. 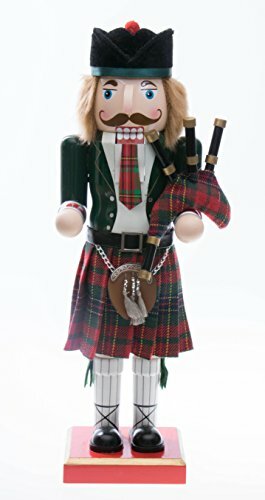 GREAT DESIGN: Featuring a traditional scottish nutcracker with a green jacket, plaid kilt and bagpipes, this piece of home decor is sure to please. PERFECT SIZE: Perfect on tables, shelves, counter tops, and more, this nut cracker measures 4.24" x 4.25" x 14"